Agent Malano leading the 1983 containment parade. A parade with production value comparable to that of the concurrent Sinulog1 festival in Cebu City. Anatine imagery should be incorporated into floats, props, and costumes. 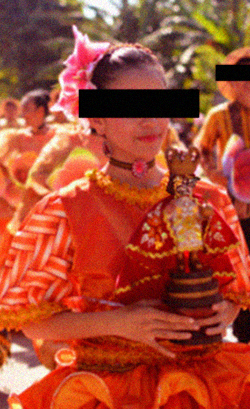 The parade should be led by a young, ornately dressed female carrying a modified Santo Niño figure. An hourly ceremony in which bibingka, pandesal, and leche puto3 are fed to live ducklings. In the event that SCP-3906 enters an active state, mass amnestics must be immediately dispersed through the affected population. Cover stories to explain the disappearance of deceased individuals are available in DOC-3906-CS. To minimize loss of life during a potential breach, Foundation agents embedded in Filipino media outlets should intermittently propagandize the consumption of balut. Description: SCP-3906 is an anomalous phenomenon localized in and around the Central Visayas region of the Philippines. It typically remains dormant, but will enter an active state if containment procedures are carried out inadequately. In the event that SCP-3906 becomes active, approximately 2.5% of individuals who attended or observed a Sinulog-Santo Niño Festival will have a variable amount of their body mass converted into rock salt, vinegar, siling labuyo,4 and embryonic ducks. The converted materials have no further anomalous properties and are safe for human consumption unless otherwise contaminated by bodily fluids. The area of the body affected by SCP-3906 is presumed to be random. SCP-3906 is often fatal even in cases where very little mass is converted, as the brain and other vital organs are at risk of being affected. The amount of converted mass varies with each individual, though it appears to be inversely proportional to the amount of balut5 the individual has consumed over the course of their lifetime. No individual who has cumulatively consumed over 100 baluts is known to have been affected by SCP-3906. Affected individuals who have never consumed balut are invariably converted in their entirety. This rule extends to fetal humans; consequently, the case fatality rate for SCP-3906 is significantly higher than average among pregnant women. 1. An annual celebration combining traditional Filipino culture and Roman Catholicism. 2. Flowers known internationally as Arabic jasmines, plumerias, and water lilies, respectively. 3. Traditional Filipino baked goods. 4. Small peppers native to the Philippines; Binisaya siling kolikot. 5. Southeast Asian street food consisting of an embryonic duck that is cooked and served in its shell.